What is the disc brake rotor lateral deviation? What is the correct setup of disc brake rotors? Typically, a rotor should have a maximum lateral deviation of 50 micrometers. This means that the difference between the values of minimum and maximum lateral measurements should be 0.05 millimeters. How to determine the run out of disc brake rotors? Put the vehicle in the Neutral shift. Remove the rotor, make sure that there is no dirt behind it and refit the lug nuts if they are loosen. Fix the rotor back on the wheel hub and tighten it securely. Fix the dial indicator on the brakes caliper. Position the dial indicator, so the plunger touches the surface of the rotor at roughly 1 centimeter from the exterior edge of the rotor. Move the dial indicator until the plunger is slightly preloaded and perpendicularly aligned on the surface of the rotor. Slowly spin the rotor clockwise. If necessary refinish the motor and mount it back on the wheel hub. 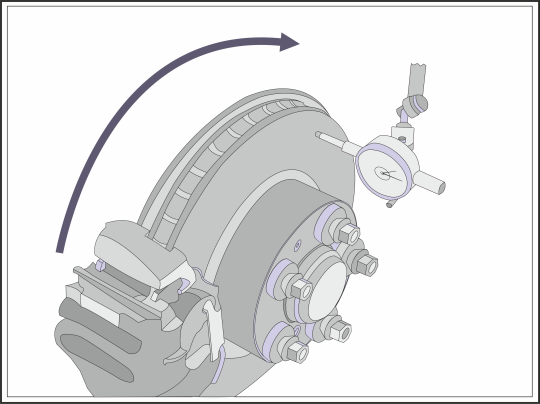 Repeat the above steps to make sure that the rotor lateral deviation is within the vehicle specifications.